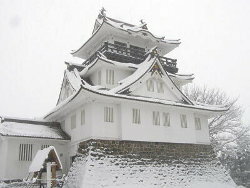 Yokote Castle is classified as a hilltop castle, and is located in Akita Prefecture. During the pre-modern age, it found itself within the borders of Dewa Province. It is associated with the Onodera, Tomura clans. Dates in use: 1554 - 1868. Only ever a small-scale castle, it consisted of little more than the Honmaru (main enclosure) & the secondary, Ninomaru. The Onodera clan did build up the castle in the mid 1500's but it is believed fortifications had existed for hundreds of years before this. 1554 The Onodera clan built this castle atop Asakura Mountain. 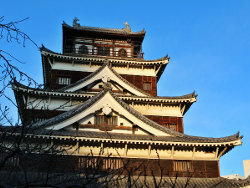 They had previously resided in Numadate castle. 1601 The Onodera clan were stripped of the fief after siding against the Tokugawa clan in the Battle of Sekigahara. They did however go on to serve at Tsuwano castle. 1602 The fief was awarded to the Satake clan. 1615 This castle continued to exist as a branch castle to Kubota castle despite an ordinance limiting each domain to one castle. 1868 The castle was burnt to the ground during the Boshin war. 1965 The main tower was rebuilt in the secondary enclosure.